This is a great dog food but it is far too expensive for the average dog parent unless they have a very small dog. While there are no reservations recommending this dog food, it should be noted that this is not a complete ration. Dog parents need to add their own meat source to this mix in order to make a meal for their dog. Freeze-dried ingredients keep well over time. An 8lb bag of this premix is supposed to make about 40lbs of dog food. If this is true then it is a good value for a premix grain-free food but from some customer experiences with Honest Kitchen premixes and foods, freeze-dried and dried premixes often make a larger claim than what it actually makes when mixed with water. Dried potatoes are the first ingredient and sweet potatoes are the third ingredient. While potatoes are something that dogs really love, this food is expensive for something that has potatoes as the first and third ingredients. Cranberries, blueberries, carrots, and bananas provide a variety of vitamins and antioxidants. The idea of a premix that you just add water and meat to for dog parents that are trying to have a fresh and grain-free diet for their dog is great. Buying bulk, fresh chicken and cooking it and adding to this mix would definitely be something dogs would go crazy over. USDA Potatoes, Flax, Sweet Potatoes, Carrots, Celery, Apples, Bananas, Blueberries, Cranberries, Pumpkin, Garlic, Vitamin A, Vitamin D3, Vitamin E, Niacin, Iron, Calcium, Phosphorus, Zinc, Riboflavin, Thiamin, Potassium, Manganese, Chloride, Copper, Magnesium, Pyridoxine, Cyanocobalamin. Like any dog food, a gradual transition is recommended with longer times being better for dogs that are prone to stomach sensitivities. Replace your dog’s food with this pre-mix and your meat of choice over a 7-10 day time period. For each cup of Grandma Lucy’s add 1 – 2 of warm water, mix and serve. To know how much to feed you should calculate how many calories your dog is consuming with their current kibble and then divide that by 390 calories. This will tell you how many dry cups you need to mix up for your dog. While Grandma Lucy’s has a feeding chart on the back, it is very detailed and based on activity levels. The amounts suggested are just guidelines. 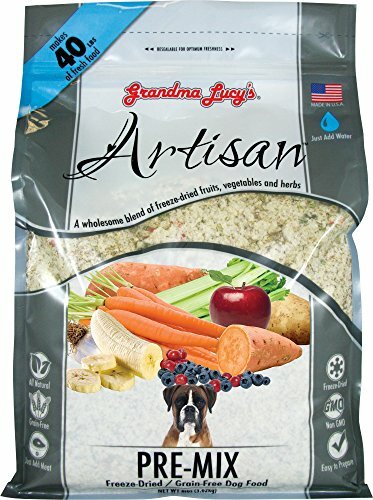 Grandma Lucy’s feeding amounts should be adjusted to meet your dog’s activity level and metabolism. Dogs that are pregnant or nursing may need three times as much food. Only mix up what you need for one meal if you can but if you have extra the leftovers can be refridgerated for a day. This is a good premix for those that want to provide a grain-free minimal ingredient diet for their dog. The high cost and the main ingredient being potatoes makes one cautious about buying. Grandma Lucy’s is careful about how they source their ingredients and what they put in the dog food, though they should have probiotics added to the mix. This would be a good base for those that want to cook for their dog but don’t have the time to combine all the ingredients. Dogs with allergies and sensitive stomachs would do well on this food.